How big do icebergs get? Reporting on Antarctica is difficult–it’s really tough to convey the sheer magnitude of the ice shelves, from the cliffs towering hundreds of feet tall to the vast, lonely whiteness. For someone who’s never been, like me, we resort to analogies. For example, the piece of the Larsen C Ice Shelf that just broke off is roughly the size of Delaware. Following this story for the PBS NewsHour has given our team a new appreciation for the immensity and power of this ice. Few people have been able to experience these brutal yet gorgeous environments. This is exactly why it’s difficult to study the polar ice caps–lack of data. Satellite image of Larsen ice shelf, 1963. Much of the ice in the top left of the image is gone now. Credit: J. Glaciol. Some of the earliest images collected of Larsen C, for example, were aerial photographs and satellite images captured by the U.S. in the 1960s. 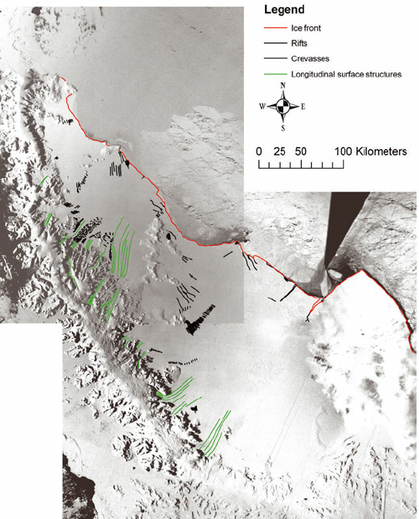 Interestingly, NASA reports that “[t]he rift that has produced the new iceberg was already identifiable in those pictures, along with a dozen other fractures”. This doesn’t mean that climate change isn’t the cause of this most recent calving event–in fact, we’ll probably end up hearing exactly the opposite in the coming months and years. Now that the iceberg has calved, scientists will be able to get more data and assess how much of the damage was directly due to climate change. But, back to the immensity of the ice. One of the main problems with showing video of aerial flyovers or satellite images is that there’s nothing really to give the eye context. There’s no buildings, no stadiums, nothing manmade that we all have experience with. Is that cliff 100 feet or 100 inches tall? A cool way to get some visual context is to watch old footage of Navy operations in the area. Check out this documentary-style report that the Navy put together for operation Deep Freeze, which began in 1955. Watching the icebreaker USS Glaciercrash through the whiteness is especially powerful. The USS Glacier came back to Antarctica the following year, for Deep Freeze II. That year, it came across the largest iceberg ever recorded. Official estimates put it upwards of 12,000 square miles, or more than twice the size of the chunk that just broke off Larsen C.
This is before anyone had satellites, so we don’t have any aerials of this icy behemoth. What we do have are… analogies! If the piece that just broke off Larsen C is about the size of Delaware, this 1956 iceberg was about the size of Maryland. 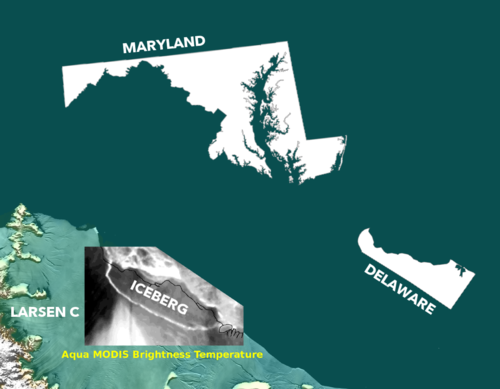 If recent Larsen C iceberg is Delaware-sized, the largest ever recorded was Maryland-sized. Modified Project MIDAS image. But even this massive, little-known iceberg is not as big a deal as the Larsen C. The USS Glacier spotted this ‘berg off the coast of the Ross Ice Shelf, the largest ice shelf in the world, opposite the Larsen Ice Shelf on the western part of Antarctica. Going off current estimates, this largest iceberg, assuming it calved off of the Ross Ice Shelf, only constituted 6.5% of its parent shelf’s area. Larsen C’s newest loss represents about 12% of its surface, a chunk of staggering relative size. Finally, if you are still interested in getting a better feel for the size and beauty of these landscapes, I highly recommend this clip of the largest calving event ever caught on tape. It’s from the awesome documentary Chasing Ice, which is set in Greenland, but the point remains the same.